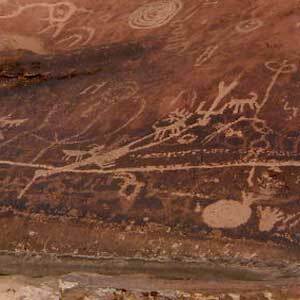 Rock art consists of petroglyphs, pictographs, and geoglyphs. 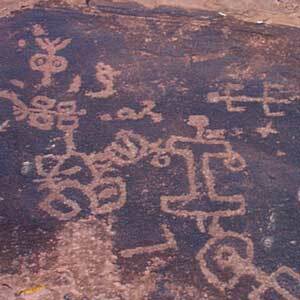 Petroglyphs are images carved or pecked on rocks or rock walls. 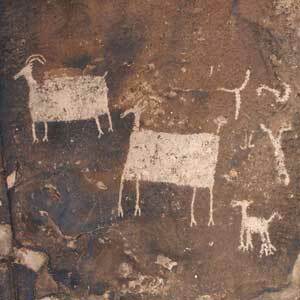 Pictographs are painted onto the rocks, using brushes, fingers or even spraying paint with the mouth. Geoglyphs, sometimes called intaglios, are images made in the desert floor by scraping away stones to make a design. Not aliens, FOR SURE!!! These images were made by early Native Americans, from the remote Desert Archaic Culture, to Fremont, Hohokam, Mogollon, Patayan, and Ancestral Puebloans (Anasazi) to more recent cultures, for the pupose of communication. These images have many meanings: from their use for spiritual teaching to young tribal initiates, to lessons for the more mature on The Greater Journey of Life, to depictions of the visions experienced by shamans, clan symbols staking out a territory, hunting and water location information, or sometimes, a way of saying "We were here!" that has echoed down through the ages. They are NOT simple graffiti- rock art is simply too much work to make. WHERE ARE THOSE PEOPLE NOW? WHY DID THEY DISAPPEAR? The people that made these images did not "disappear"- they are still right here today. Their descendants are the modern Hopi, Zuni, Acoma and other Puebloans, the Paiute, Mohave, Quechan, Cocopa, Maricopa, the Pai Groups, and many others- just ask them! 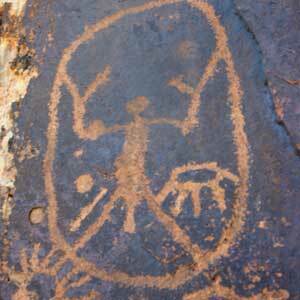 Most of these Native Americans have an unbroken tradition associated with rock art sites, and consider them sacred. HOW CAN WE LEARN MORE ABOUT ROCK ART? Remember, rock art is the expression of the belief system of an ancient culture. IT SIMPLY CANNOT BE ISOLATED FROM THE PEOPLE WHO MADE IT. To understand rock art, you have to get to know the people, both ancient and modern, associated with it. One way is to learn more about other physical aspects of their culture- pottery symbols, textiles and jewelry, kiva wall murals, and the shape and style of their buildings. More importantly, you have to learn about the people themselves; what they believed, what stories and legends they had then, and still have today. We can learn about rock art from several sources: from modern archaeological methods of investigation and site recording, and from the Native Americans themselves, our most important source of knowledge. Visit our other sites by clicking on Kokopelli!